16 Nov 2018 --- Health Logics is launching a dietary supplement containing S-adenosylmethionine. Also known as SAM-e, produced by advanced biotech company Gnosis, the ingredient is touted as improving joint, brain and liver function, and enhances mood and cognition. As an essential human methyl donor, SAM-e is critical to a person’s overall health and well-being, particularly when it comes to the care of the brain, joints and liver. Methylation is a process by which methyl groups are added to the DNA molecule. During methylation, SAM-e may act as a methyl donor and support many chemical reactions. 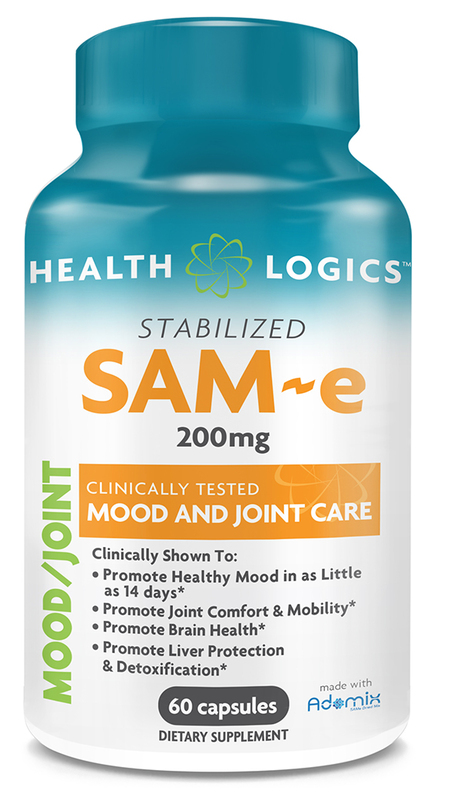 Click to Enlarge“Stabilized SAM-e is a clinically tested mood and joint care supplement. It has been proven to promote joint comfort and mobility, brain health, detoxification and liver protection. In fact, SAM-e has been clinically shown to promote healthy mood in as little as 14 days,” says Frank Borzilleri, of Health Logics. The human body naturally produces SAM-e, yet with age and certain dietary patterns, its levels may decrease. Health Logics’ supplement can replenish SAM-e levels in the body. SAM-e in the form of 200mg capsules in a patented, stabilized form that does not require enteric coating. To ensure the highest quality SAM-e, Health Logics utilizes Adomix, a high absorption form of SAM-e produced by advanced biotech company Gnosis. SAM-e is gluten-free, contains no solvents or artificial colors, is non-GMO and is manufactured in a cGMP compliant facility, according to Health Logics. Health Logics says it uses patented and trademarked ingredients in its products because these ingredients are known for their efficacy and have undergone clinical and analytical testing validation. Cognitive health has proven to be a growing category, with new products appealing to consumers from all walks of life, from more senior citizens seeking to prevent cognitive decline, to busy office workers looking to combat mental fatigue. NutritionInsight recently reported on the topic by speaking to suppliers about their views on this growing category. While in Asia, consumers are increasingly snacking as a way to manage their mood. According to a research report on the most prominent snacking trends in Asia, released by the Australian Macadamia industry, consumers are snacking to destress or unwind, to enhance a social engagement, or as a pick-me-up for energy.